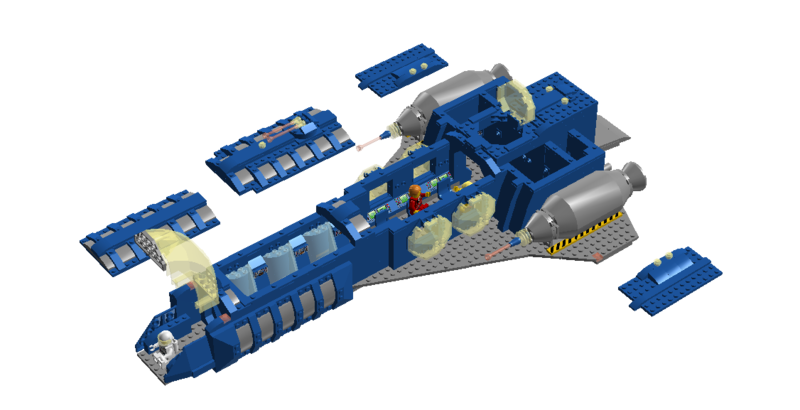 In terms of actually produced sets, the largest LEGO Classic Space ships are things like the 928 Galaxy Explorer and the 6985 Cosmic Fleet Voyager. These were large sets, to be sure. 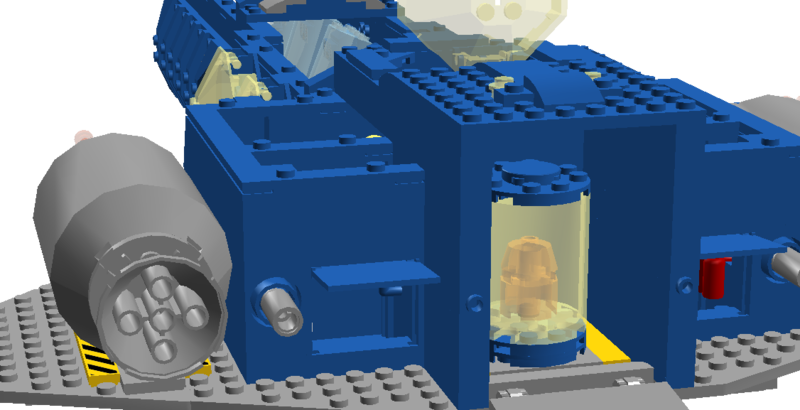 If they had had all the greebles and decorative pieces of modern sets, they’d probably be in the 800+ piece range. But in absolute terms, they’re pretty paltry things, and there’s no way that they can be the largest ships the Classic Space Federation possesses. We know this from the fact that 90% of the ground vehicles sold in Classic Space sets will in no way fit into the cargo bay of an LL928 Galaxy Explorer. The Federation might build some of their planetary vehicles on-site, but I doubt this is the case for all of them, so they have at least one transport ship that’s bigger than Galaxy Explorer, and they ought to have a whole series of transorbital ships that aren’t designed to be able to land. Big galactic cruisers with crews in the hundreds or thousands of minifigures. Giant carriers with hangar bays for multiple 924- and 928-class ships. The generic names of these ships are a bit of a puzzle. Sets 928 and 924 both got called “Space Cruiser” in different parts of the world, and that’s about the most non-militaristic-sounding “big ship”-type name I can come up with. 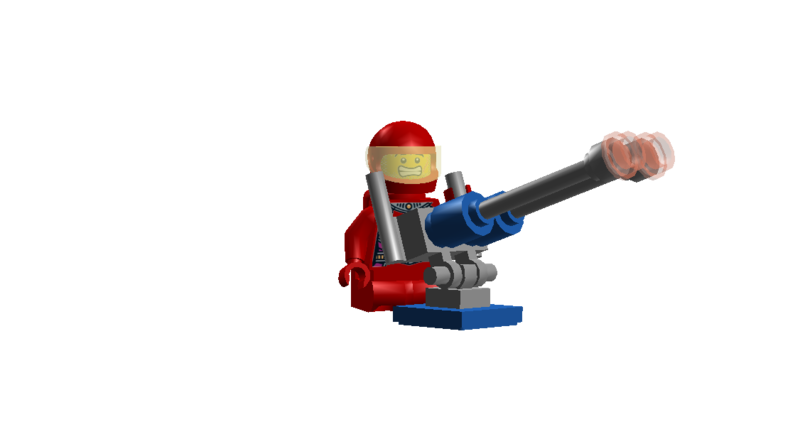 Given The LEGO Group’s feelings about warlike toys, it seems improbable that the big ships of the Galactic Federation are “battlecruisers” or “destroyers” or “dreadnoughts”. 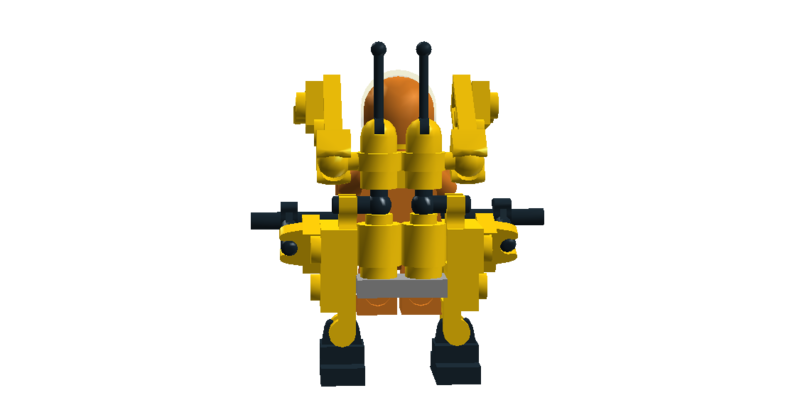 I’m proposing a modification of “space cruiser”. Since the “Space Cruiser” is designed for transatmospheric work and planetary landings, a larger ship designed for transorbital operations without landing might perhaps be a “Hyperspace Cruiser”. I think it works. “Hyper-Cruiser”, “Hyper-Carrier”, “Hyper-Transport”, even perhaps “Hyper-Frigate”. 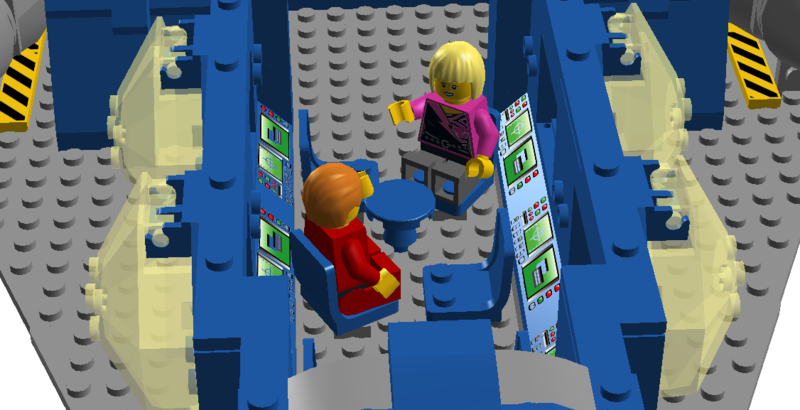 All this to say “I was in the mood to build a Classic Space ship large enough to have a proper furnished interior”. As “big” ships go, this is pretty small; something of a hybrid between the big transorbital ships I’m envisaging and the smaller transatmospheric ships we have sets of. I envisage it as a fast hyperspace transport, able to get small amounts of personnel and material across the galaxy quickly. It has a small crew complement and is able to be handled by a sole crewmember if need be, as well as an interior furnished as something other than solely a flight deck and a smallish cargo hold. The flight deck is in the forward cockpit; this “Hyper-Courier” is more on a scale at which the lovely big curved windscreen piece makes visual sense as a cockpit than the little mining vehicle where I used it before (though that worked). Behind this is a section containing sleep pods, which I’m seeing as a kind of general-purpose device that can function in multiple modes for general sleep or medical stasis, or for personal hygiene as a shower/cleaning chamber. The ship has three, though two more could be fitted further aft. Behind this is a recreation/mess area with tables and chairs, which can be turned to multiple angles to facilitate conversation. A Space Fleet officer in a red uniform is talking to someone in civilian dress. Behind this is a general-purpose space with a domed roof; this would be configurable for multiple uses depending on the ship’s mission. Currently mostly empty, it might be used to store mission gear, or hold more sleep pods, or whatever. Directly behind this is the cargo hold. Larger than that of a 928 Galaxy Explorer, it is still not a big cargo volume, and given the ship’s courier role would generally be employed for small amounts of time-sensitive or particularly valuable cargo. On either side of this, the Hyper-Courier has airlocks. Actual, functioning airlocks that mean that the passengers and crew don’t need to weap spacesuits in the interior. The 24th Century version of OSHA probably requires flight crew to be suited while on duty in a ship of this size, but technically the interior space is pressurised, as it ought to be. 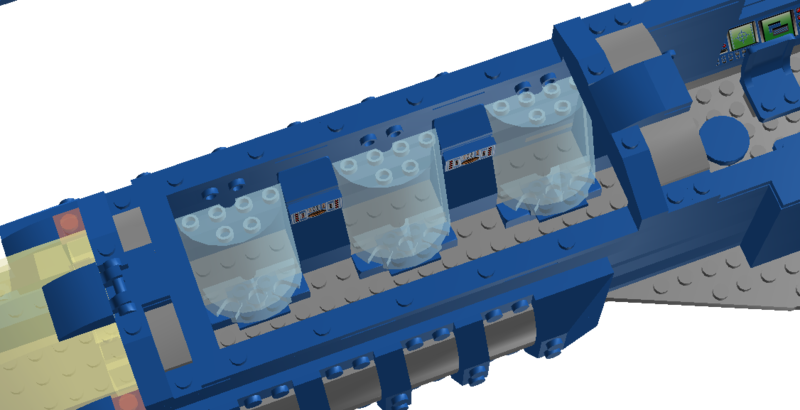 Each airlock has a space for astronaut airtanks and a hook upon which to hang a helmet. 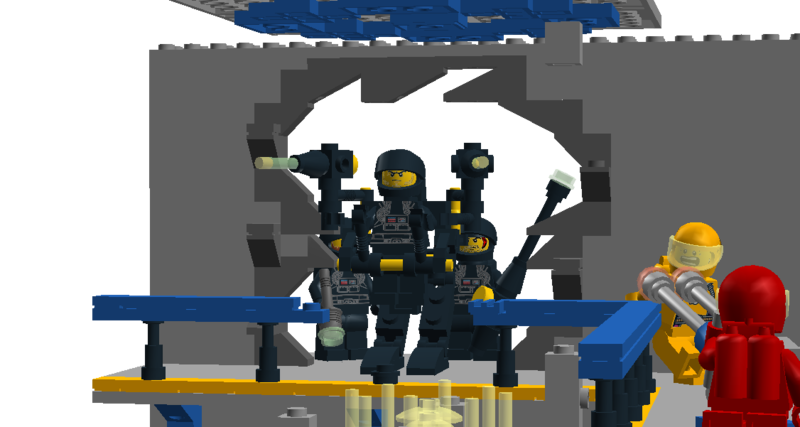 Because of the vagaries of LDD, I’ve included the airtanks but not the helmets. They have an interior door (full height) and an exterior hatch (smaller). I have abandoned the design I used on the Orion Transport, both because it was overly complex without actually fully working, and because the design wouldn’t fit in this Hyper-Courier. 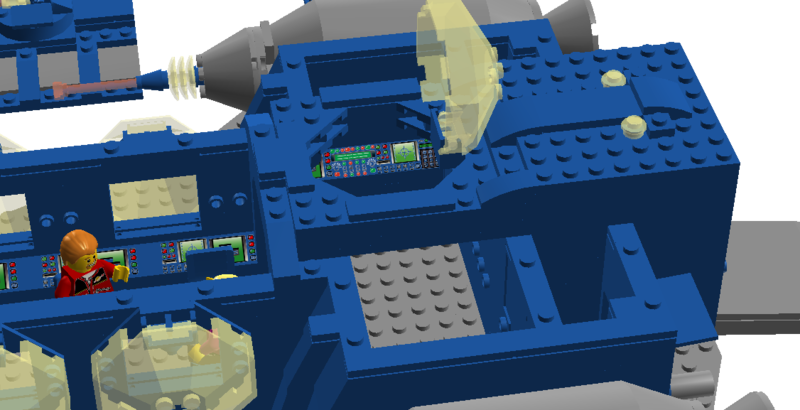 This entry was posted in Lego Classic Space, Saurian Sector and tagged Classic Space Lego, LDD, Lego, Lego spaceship on April 30, 2015 by geoffhorswood. The backstory for this diorama is that a Galactic Federation base is under attack by Blacktron forces. It’s not going well for the Federation; the base has been penetrated and largely overrun, but a plucky band of Classic Spacemen have made a valiant stand in Power Room 3. The Classic Space Fleet defenders are a bit of a ragbag of survivors: mostly soldiers (red suits), but also a pilot (white), a commander (blue), a medic (silver) and a couple of power room techs (flame orange). These last two colours are my own designations unattested in the official Classic Space universe, but I think they’re a reasonable extrapolation. The Blacktron have broken through the walls and are beginning to bring in their shock troops, led by a Wardog mech. 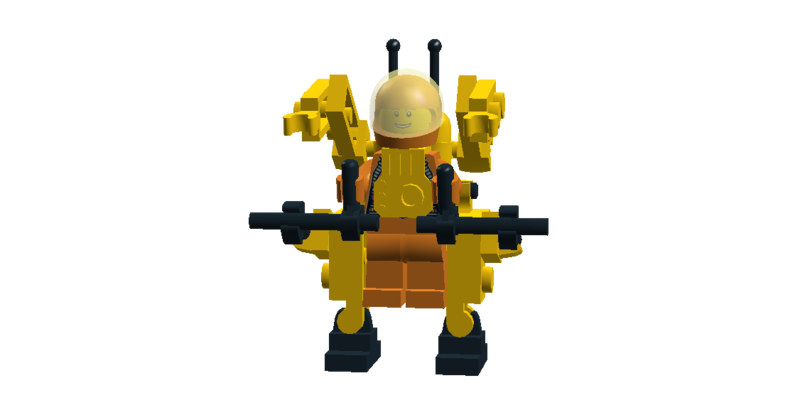 The Federation have a mech of their own, but it’s a smaller one: just a Tactical BUNNIE Suit (see previous post). The medic is tending one of the power room techs, who has been injured, while the commander radios desperately for backup. On the second storey, a rather agitated Federation astronaut readies a mobile laser gun. A terrified power tech flees the Blacktron advance. 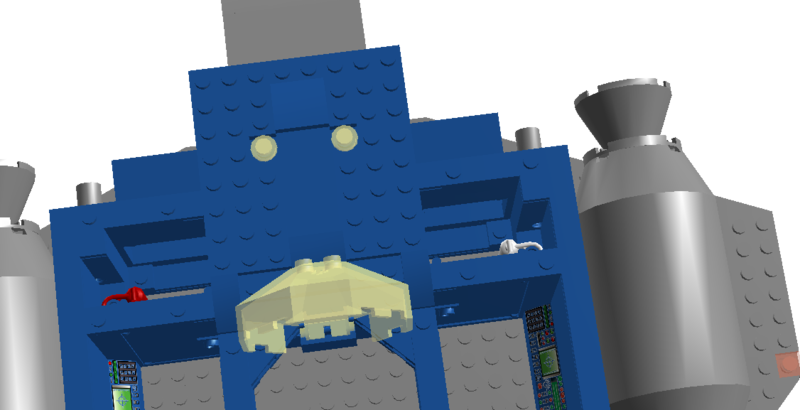 I’m quite pleased with all the details I managed to cram in, though a little less pleased with quite how much the reactor itself hides many of these. 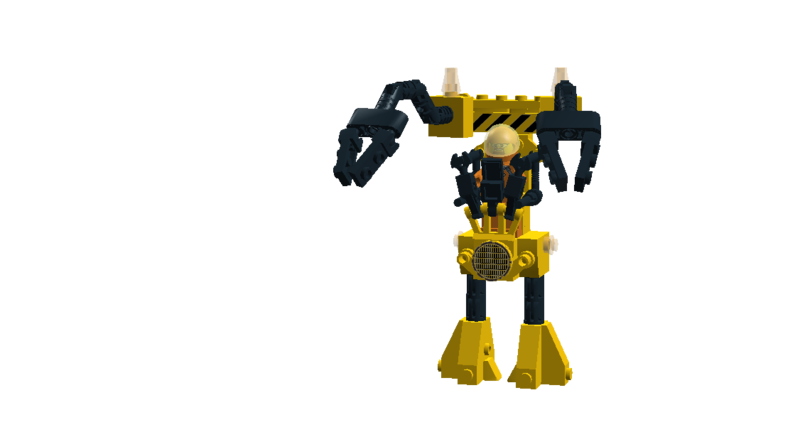 I hope you enjoy this model. I certainly had fun building it! 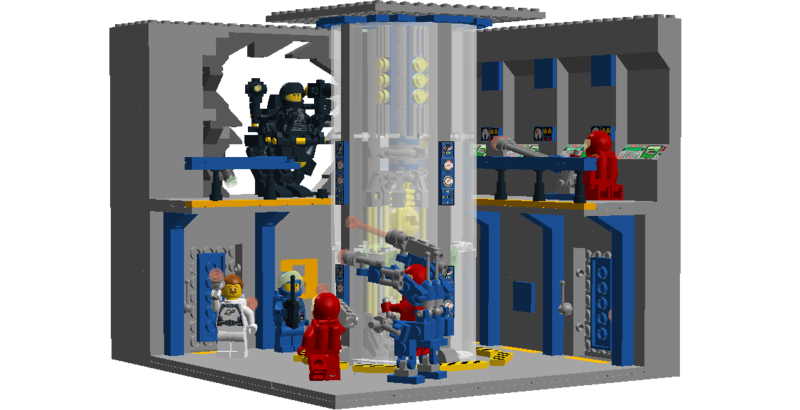 This entry was posted in Lego Classic Space, Mechs and tagged Battle Scene, Blacktron, Classic Space, Diorama, Lego, Lego Digital Designer, Neoclassic Space Federation, Space on April 22, 2015 by geoffhorswood. The BUNNIE Suit is a type of construction equipment having no parallel in 21st Century construction. 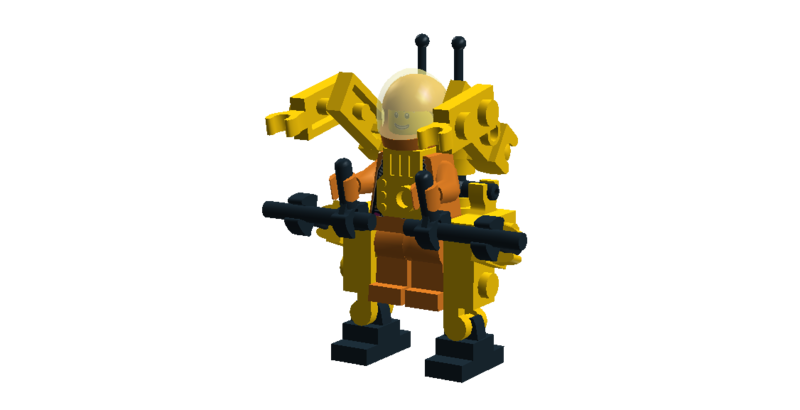 Sometimes called a “mechsuit”, it is a mech-type vehicle that is worn rather than piloted; a strength-augmenting exoskeleton used to make light of much of the heavy lifting of the construction industry. The acronym stands for Basic Utility Neural Net Interfacing Exoskeleton; however, most authorities agree that this is an after-the-fact name derived from the rabbit-ear-like antennae projecting above the pilot’s head. It is a matter of record that the first test pilots jokingly referred to it as a “bunny suit” due to the appearance of the antennae. Useful for heavy lifting in enclosed spaces where even a small mech will not fit, BUNNIE Suited construction workers move and place all kinds of parts and equipment, operate laser welders and plasma saws, lay control fiberoptics and power lines, and perform many of the smaller-scale tasks of the space construction site. 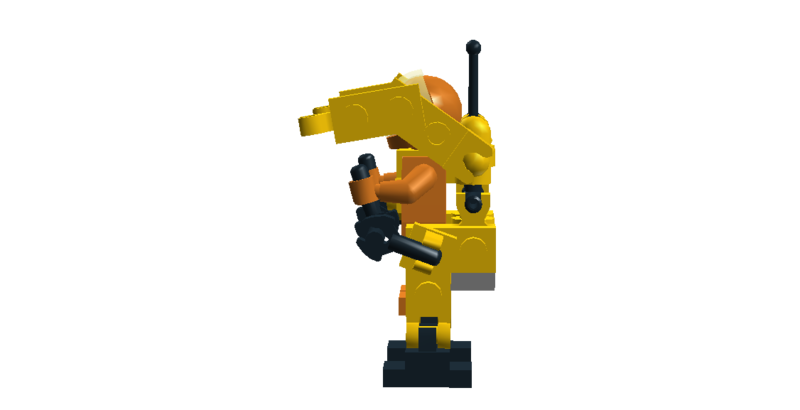 This entry was posted in Lego Classic Space, Mechs, Saurian Sector, Space Construction and tagged Classic Space, Construction, Lego, Lego Space, Mech, Neoclassic Space, Space Construction on April 15, 2015 by geoffhorswood. Classic Space is fun. The adventures of the nameless astronauts of the Galactic Federation, exploring the galaxy and countering the villainy of Blacktron. No story except what you make yourself. A chance to let your imagination take you to the stars. The Classic Space astronauts, obviously, come in different colours. There seem to have been multiple versions of what the different suit colours mean. It seems fairly obvious that they denote different departments, but which ones? 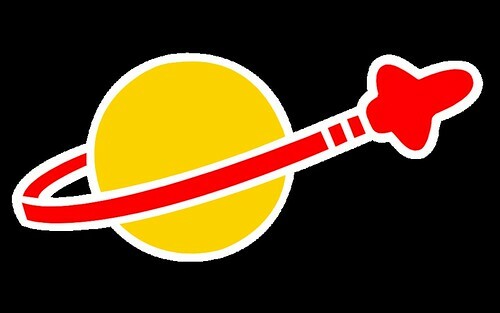 Brickipedia says that the red astronauts are pilots, the white astronauts are explorers, the yellow astronauts are scientists, the blue astronauts are soldiers and the black astronauts are spies. 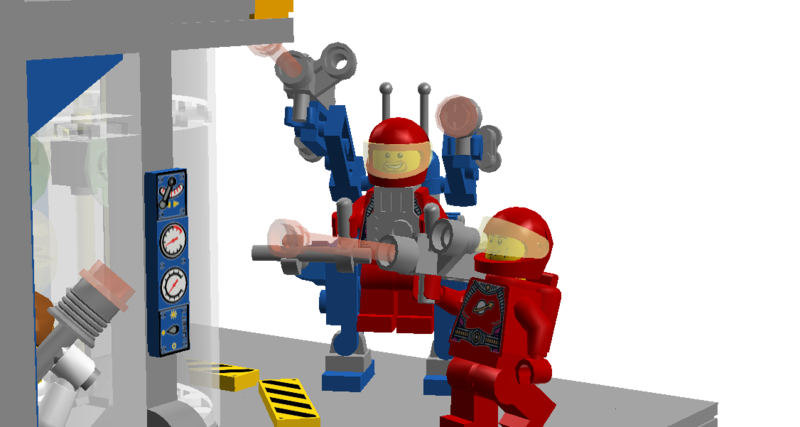 LEGO Ideas says that the red astronauts are soldiers or explorers, the white astronauts are pilots, the yellow astronauts are scientists, the blue astronauts are commanders and the black astronauts are spies (which I’m choosing to interpret as intelligence and internal security). 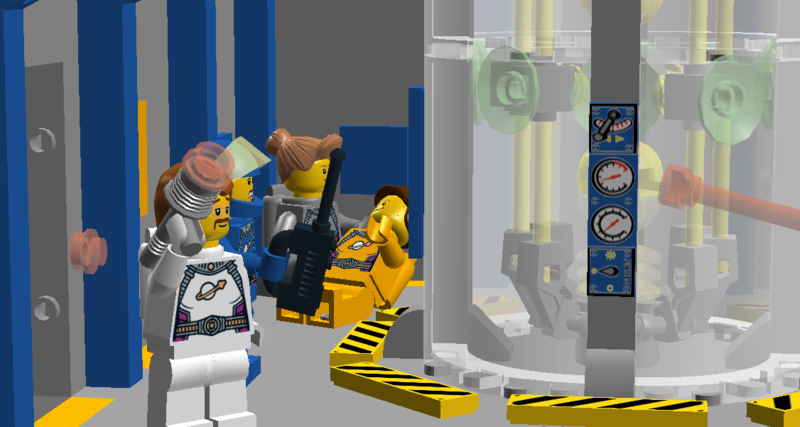 The new green astronauts (that come with the LEGO Ideas Exo-Suit) are supposedly mech pilots. 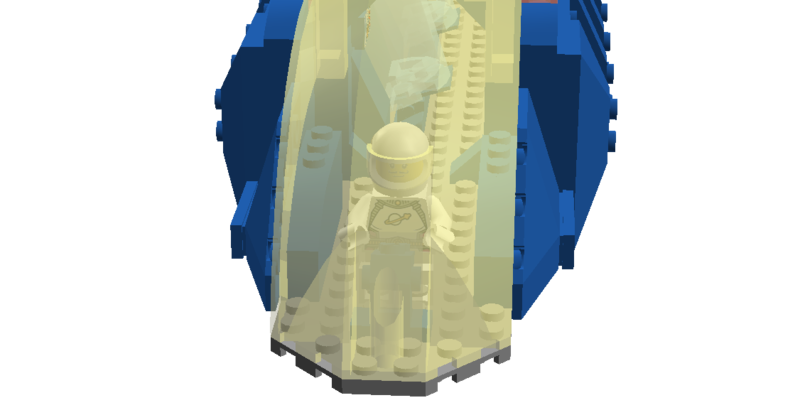 Brickipedia claims their source is the creator of the Classic Space theme, but LEGO Ideas is actually written by LEGO staff, so it seems as close to official as we’re probably going to get. I’m going with it. And extending it in different directions. But not everyone in the Federation is going to be an explorer or a pilot. They are going to need environment technicians, doctors, dockworkers, and miners, and that’s just the ones who will definitely need spacesuits! And they will also need construction workers. In some ways it was probably inevitable. I mean, I love Lego Classic Space and I work in construction. It seems almost bizarre that it’s taken me this long to put the two together. But then, I don’t know that anyone else has done it, either. So, Space Construction. The guys in the orbital shipyards who put the SPACESHIPs together, and the guys on the ground who assemble the bases. They aren’t soldiers, pilots, scientists or commanders. 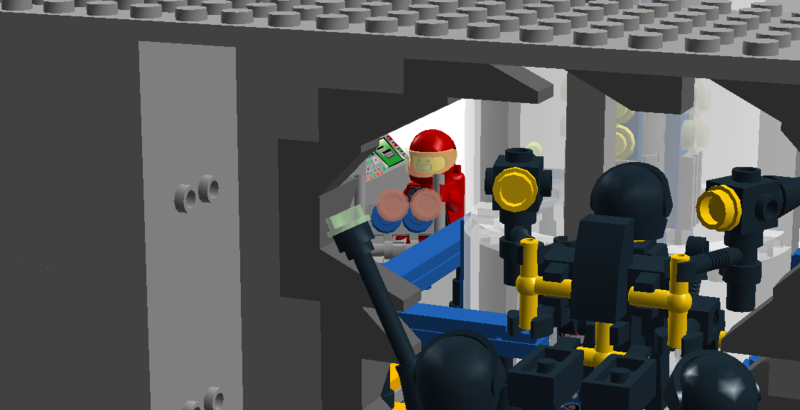 They’re Emmet in space. Orange seems like an appropriate spacesuit colour, with the full near-hemispherical visor I’m using to denote civilians. Of course, this is the future. They probably aren’t going to be using early 21st Century bulldozers and excavators and dump trucks. We have to think a little bit about what the 24th Century might need their machines to do. Robodozers? Probable. Laser cutters rather than excavators or drilling machines? Plasma graders? Rock fusers rather than concrete mixers? Laser welders? Giant robotic excavators? We obviously don’t want everything to be automated, because who wants to play with a robot bulldozer? 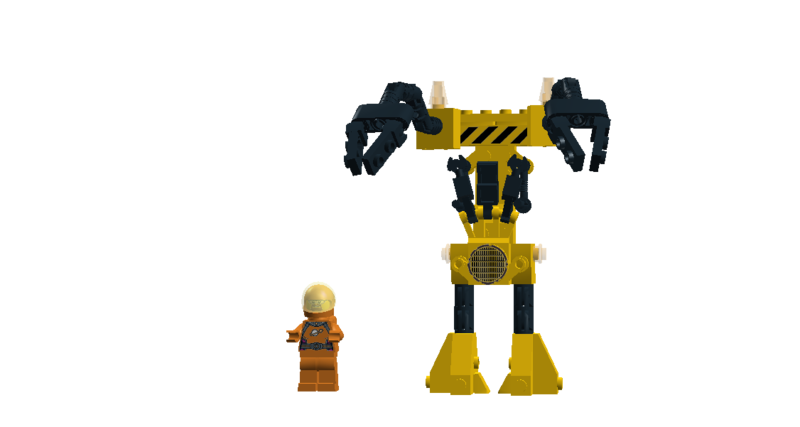 But the heavy equipment probably shouldn’t look too much like the stuff from the regular LEGO City. 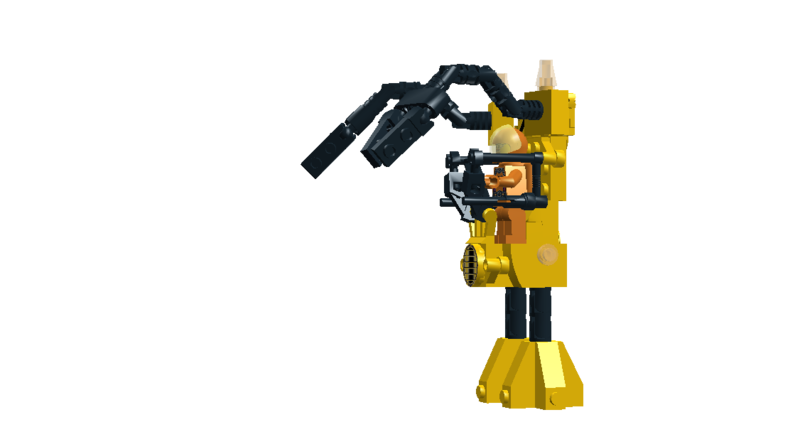 The L4 is one of a series of general construction mechs built by the Grubb Corporation. As mechs go, it is a relatively light vehicle, and serves as a general-purpose hull to which various kinds of equipment can be attached. 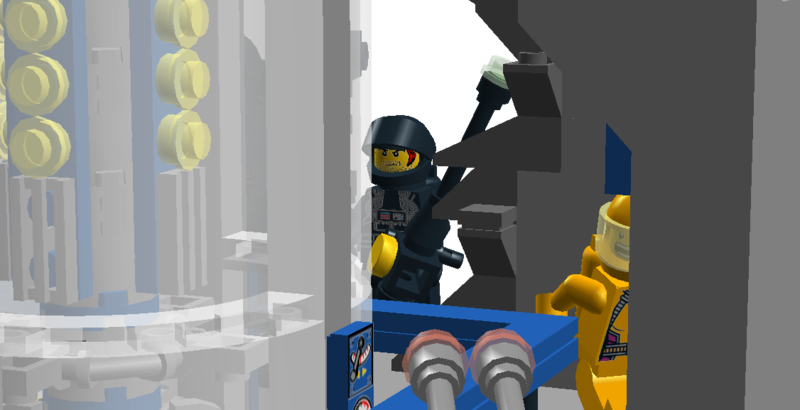 The factory-standard model comes with a pair of grasping arms, but one or more of these can be replaced with other gear as appropriate. Examples of alternate gear include modern plasma welders, laser cutters and antigravity cranes as well as older equipment such as fine manipulators, or even ancient devices like shovel blades and physical hooks. 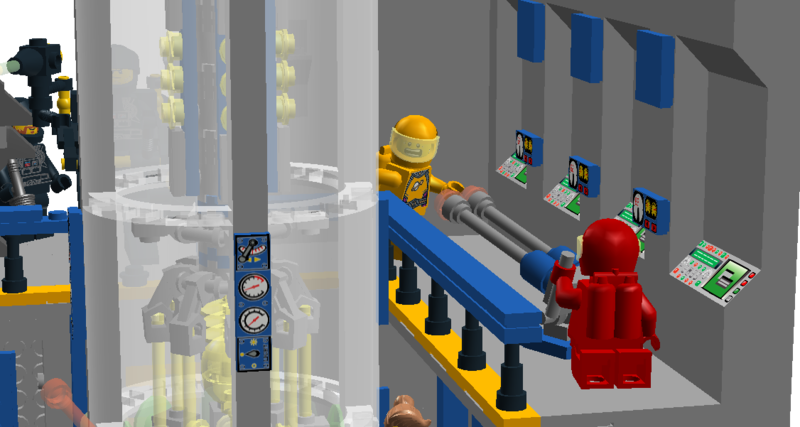 Thanks to modern integrated computer management, switching out the various kinds of equipment is a relatively straightforward process: simply perform the physical switch and the L4’s onboard computer provides the necessary control alterations in a matter of moments. The L4 is thus one of the most versatile of smaller construction vehicles; akin to the tractors of 20th and 21st Century construction. 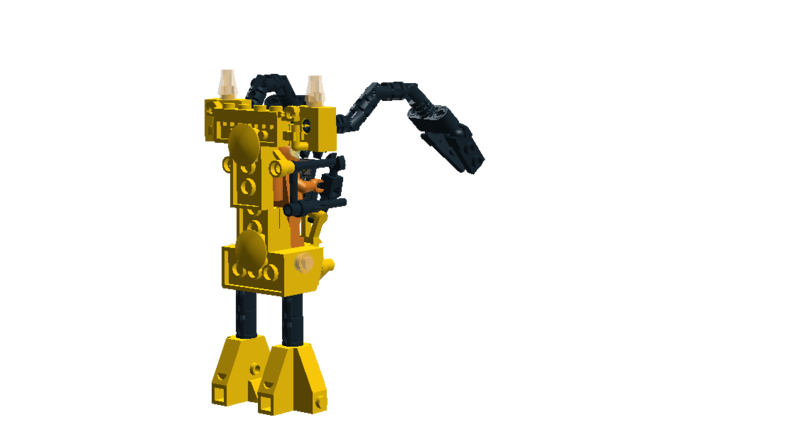 Controlled by a single pilot, like most of the Grubb Corporation’s hardware, the L4 is merely one example of a graduated series of construction mechs. The largest, the L12, is the size of a large building and optimised for excavation, whereas the smallest, the L2, is about half the size of the L4. From the earliest days, construction vehicles have been painted yellow for easy visibility in the often-dangerous environment of a construction site, and this custom continues to this day. 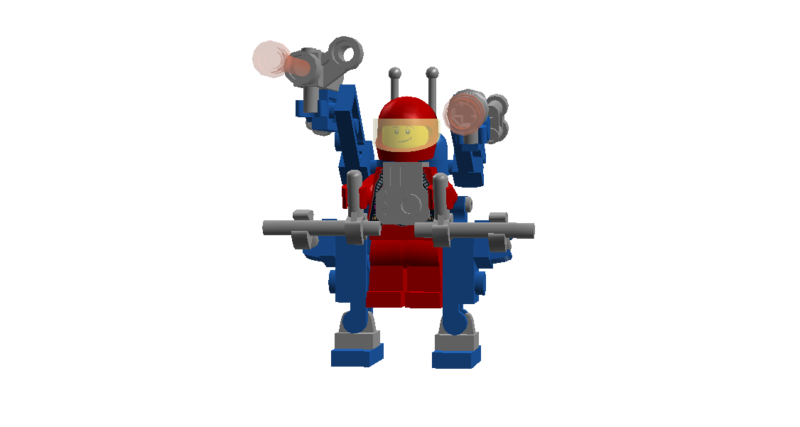 This entry was posted in Lego Classic Space, Mechs, Space Construction and tagged Classic Space, Construction, Lego, Lego Space, Mechs, Neoclassic Space, Space Construction on April 5, 2015 by geoffhorswood.